(17/P57) TRENTON – Montclair State University is resuming the second phase of a Department of Environmental Protection-funded study of clinging jellyfish, a small, invasive jellyfish that packs a powerful sting, which was reported in Monmouth County waters last year. While last year’s study was used mostly to survey, confirm and collect multiple specimens of the quarter-sized jellyfish, this year’s scientific work will attempt to further investigate distribution and breeding patterns of this species in the Shrewsbury River and its biology. Last June, a small number of clinging jellyfish (Gonionemus vertens) were observed and recorded in New Jersey for the first time. Following that first single observation in the Manasquan River, more were observed in the Shrewsbury River, prompting DEP and Montclair State University to initiate a sampling plan for assessing the abundance of clinging jellyfish in New Jersey waters. Sampling was conducted last June through August in the Shrewsbury River, Manasquan River and northern sections of Barnegat Bay, where the jellyfish has not yet been observed. No clinging jellyfish have been found on coastal beaches, nor are they anticipated, as they prefer to cling to vegetation found in sheltered bay and estuarine waters. This year, seven sites within the Shrewsbury River estuary where the species was found are being sampled, as well as other locations in the Manasquan River and Northern Barnegat Bay, While the first two sample sessions in late May in these waters yielded no clinging jellyfish, a total of 17 small adults were identified from the Shrewsbury River on Friday, June 2. “It’s the polyp phase of the life cycle that persists from season to season and may be the reason for the return of the jellyfish to the Shrewsbury River,” Gaynor said. The clinging jellyfish, a native to the Pacific Ocean, is very difficult to spot in the water. A sting can produce severe pain and other localized symptoms and, in some cases can result in the need for hospitalization. The studies involve systematic trawling of the water to collect any jellyfish that may be present, as well as the deployment of artificial sea grass mats to see if they attract clinging jellyfish, and genetic analysis. The DEP will release its findings to the public after the study is concluded. Crews on boats will be using zooplankton nets in open water in an effort to capture adult jellyfish. The clinging jellyfish is not known to inhabit ocean beaches or other sandy areas, but tends to attach itself to submerged aquatic vegetation and algae in back bays and estuaries, areas not heavily used for swimming. 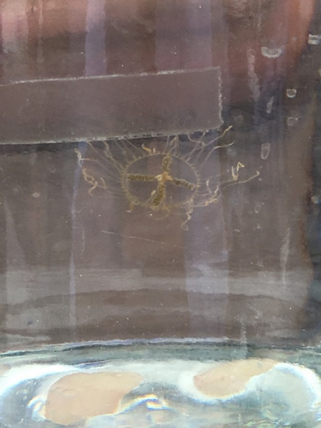 According to the Woods Hole Oceanographic Institution, the clinging jellyfish has a red, orange or violet cross across its middle. Each jellyfish can trail 60 to 90 tentacles that uncoil like sharp threads and emit painful neurotoxins. Clinging jellyfish primarily feed on zooplankton. DEP encourages the public to exercise common sense and caution during recreation in areas where the jellyfish have been discovered. Anyone wading through these areas, especially near aquatic vegetation should take precautions, such as wearing waders to protect themselves. Swimming near lifeguarded beaches is, as always, encouraged.